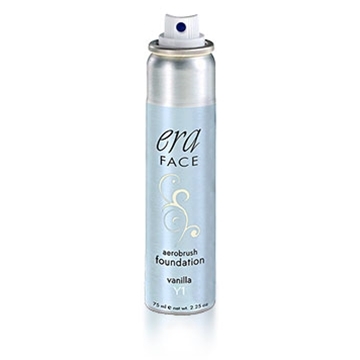 Try Era Face Foundation Risk Free! Received first order an hour ago & already placed an additional order for two. Looks natural and covers beautifully. Thrilled with products and service. Amazing Product! I have been using Era for years! I love products and try everything new but this is my main stay! If the colors don't match your skin tone perfectly remember you can mix the colors. Don't be afraid to play with application techniques as well. Sometimes I use a flat buki, sponge or spray directly. I hope you love'll this stuff as much as I do. If you have trouble you can search youtube video's. The best gift anyone can give another besides love is beautiful skin! Been wearing for years, too. Have had a problem with it not spraying but the representatives are great to work with. Naturally need today as quit spraying and is full. Hope it's not out of stock too long. Hate to have to use the old stuff. I've been using this product for 10 years and still receive great compliments on my makeup. The bronzer in the summertime makes my face glow.... is it the makeup? Absolutely the BEST foundation you'll use. Works great for Film, TV, Print. I prefer to spray it in the palm of my hand and apply with a brush. Lasts ALL day till you wash it off. Great for Body makeup!